Can a smart phone app help herders in rural Kenya find grazing sites for their animals? That’s what a pilot program is trying to find out. The herders, called pastoralists, make their living—and help feed the population—by raising herds of cattle, sheep, goats, and camels. They live a nomadic existence, moving from one patch of vegetation to another while dealing with drought, civil unrest, and land use pressures that threaten food security. “We can provide the pastoralists with information on which areas are good for their cattle,” says Carla Gomes, professor of computer science and director of the Institute for Computational Sustainability at Cornell University. But that economy is “precarious,” he says, constantly threatened by drought and a lack of government support, recently aggravated by constant violence. One of the many things needed is information. 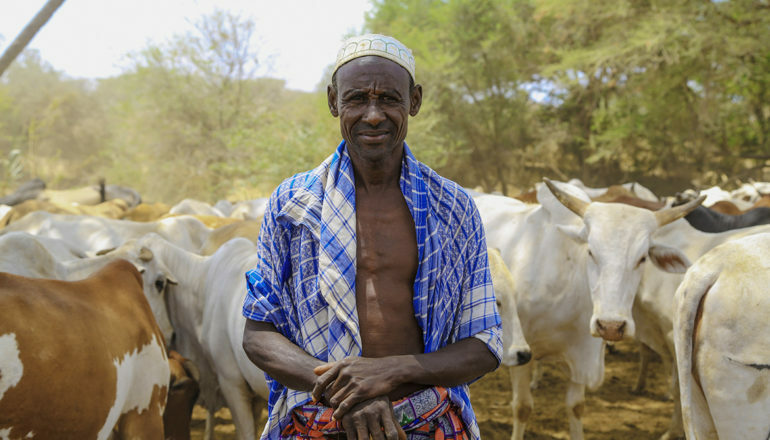 Herders need to know “Where should I take my cattle to graze?” “What price can I get for my cattle?” “Are there bandits in the area?” Now that information can be fed back to the pastoralists through their phones. Satellite images can distinguish vegetation from arid wastes, but can’t tell what kinds of vegetation they are seeing. Goats and camels can browse on shrubbery and tree branches, but sheep and cattle need grass, which grows only where there is more water. Mobile phone reports tagged with GPS coordinates are fed to a computer that learns to associate the reports with the spectral “fingerprints” in visible and infrared light of corresponding locations on the satellite images. Eventually, the computer will be able to identify different kinds of vegetation from the satellite image and that information will be fed back to the pastoralists through their phones. The researchers also envision using drones to collect information closer to the ground. Nathaniel Jensen, a graduate student in the Dyson School, is testing the system with a small group of pastoralists in the town of Isolio in Kenya. Although mobile phones are ubiquitous in rural Africa, he has given the herders new phones to ensure that everyone is working on the same platform. Upgrading from a basic phone to a smartphone is part of the appeal of the project for the pastoralists. The observers are paid for their work in mobile phone minutes, a common currency in their society. “The app is designed so they don’t have to speak the language: it’s all pictures,” says Peter Frazier, assistant professor of operations research and information engineering. By tapping icons, the user can report what kind of vegetation has been seen, how much is there, and how healthy it is. Icons might represent “No grass,” “Some grass,” or “A lot of grass.” For a double check, the observer uploads photos. Down the road it might be possible to train a computer to recognize the vegetation seen in the photos, Gomes says. While it’s updating the map, the computer also notes areas from which little information is being reported, and adjusts the incentives paid to the pastoralists to encourage them to visit those areas. Some animals are also fitted with GPS collars to track the movements of the herds. If the pilot project is successful, it will be expanded to other pastoralists. The Atkinson Center for a Sustainable Future funded the work.